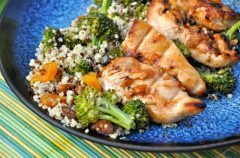 This delicious recipe for Apricot Chicken is a quick and simple dinner that’s filled with fibre and protein. Dinners like this will get you well on your way to transforming your body. Pack the leftovers for a wholesome, fat burning lunch. 1. In a medium frying pan combine the apricot preserves, coconut aminos or soy sauce, vinegar, ginger, garlic and sweet paprika. Place over low heat and mix often for 4 minutes. Rinse the chicken fillets and place in a baking sheet. Pour the apricot mixture over the chicken, and place in the fridge for 20 minutes. 2. Turn on the high grill. Line a rimmed baking sheet with foil. Place a wire rack in the centre of the sheet and arrange the marinated chicken in a single layer. Place in the oven on the top rack. After 5 minutes, use tongs to flip the chicken. Return to the oven for another 5 minutes. Allow the chicken to blacken slightly.